Small gongs, flutes, and taiko drums resound over the beat of the chant "Erai yatcha erai yatcha yoi-yoi-yoi-yoi! Some fools dance while some fools watch. . . ." Excited by the music filling the streets, people young and old are waving their hands in the air and dancing their hearts away. This is the Awa odori, a dance with a proud 400-year tradition from Tokushima Prefecture on the island of Shikoku. 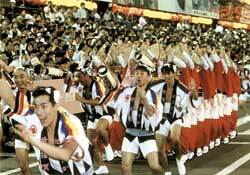 The Awa odori is deeply rooted in the everyday lives of people in Tokushima and is performed all over the prefecture. In fact, some say that in Tokushima they think about the dance all year round! The largest performance of the dance takes place at the Awa Odori Festival, held in Tokushima City over four days from August 12 until August 15. The festival features a total of 100,000 dancers and draws more than one million spectators. The dance has become one of the representative dances of Japan and is being introduced around the world as the Awa Dance. When dancing the Awa odori, people often gather in groups called ren, with other members of their workplace, school, or other organization. These ren usually contain around 50 people, although some may have as many as 200 people. One group made up of all kids is jokingly called Chirudo Ren, a play on the Japanese pronunciation of the English word children. 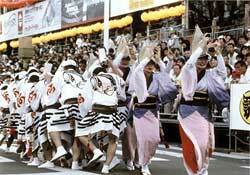 In the Awa odori, men and women wear different costumes and also dance in different styles. Men wear a happi, a light and loose-fitting cotton coat, and perform a stronger, more dynamic dance. Women wear a yukata, a summer kimono made of light cotton, and amigasa, a hat made of woven rush grass, and dance in a more stylish way. The men's dance involves bending over a bit with legs slightly bowed, raising the hands a little above the forehead, and lightly waving the wrists up and down. The women turn the palms inward and gracefully move the wrists. 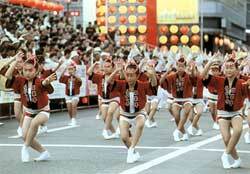 There's a saying that if you raise your hands and move your legs forward you're doing the Awa odori. That is to say, it's easy for anyone to join in and look like they're doing the dance. But if you actually give it a try, you'll see that moving your body to the two-beat rhythm can be rather difficult. But don't worry. Even if you don't know how to do the dance, you can easily go to a few lessons and then join in a pick-up dance group (niwaka-ren). You can wear whatever type of clothes you like, and it doesn't cost a thing! Two and a half hours from Osaka by highway bus. There is also a convenient one-hour flight from Tokyo. The dance location is located quite near Tokushima Station. To participate in the niwaka-ren, just go to the plaza in front of the Tokushima City Municipal Building or other designated area. Be sure to check beforehand for the appropriate time and location.